WEEKLY ONLY From 2nd week of June -Labor day, Sat. to Sat. After, 3 nite min. Looking for a large capacity Executive vacation rental in Eagle River. 22 of your closest friends and family can comfortably fit in our Luxury Executive Log Lake Home. And who doesn’t like a sandy beach, swimming raft and pier, great for all ages to play or marinate in the summer sun! Our large wrap around deck that overlooks Carpenter Lake is another popular place to enjoy our little slice of heaven in Vilas County. We exceed everyone’s inside expectations: Gas fireplace; an open concept Great Room and Dining Area; dining seating for 12 inside; plus out side seating on the deck overlooking the lake. 2 Flat Screen HD TV’s with Direct TV - living room and den. The furnished kitchen has it all: Granite countertops, stainless steel appliances, dishwasher, refrigerator, gas stove, oven, microwave, grill,coffee maker, toaster, blender, ice maker, lot of pantry items, plus dishes & utensils. All wrapped in a 'Northwoods' theme with bear lamps, moose pillows and sconces with pine trees. What will really grab your attention are the 31 feet high glass windows overlooking the deck and lake! Hop in the 15 ft. boat and drift around - we have some some life vests available. If you wish to bring your own motor, the boat will accommodate up to a 20 hp motor, or you can rent one in town. (Call ahead of your vacation to reserve). Since you book directly with me (Jane) we can help you with our paddleboat, canoes and kayaks available to rent as well. We are local experts too! Want to jump on your bikes and wind your way through the Nicholet National Forest trails, or rustic roads? For the wine connoisseurs, there is a winery tour in Three Lakes less than 15 miles away, and a few gift shops as well. We are not on the Eagle River Chain of 28 Lakes so that makes Carpenter Lake quiet and peaceful. Because of that we have nesting loons on the 350 acre lake and great fishing for walleyes, northern, small and large mouth bass and pan fish. 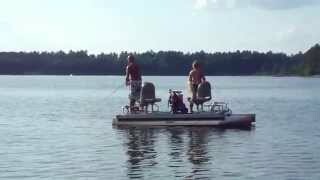 If you would like, you could rent a pontoon or boat and enjoy the livelier Eagle River chain of lakes – Water ski and tube from sunup to sundown and boat to a number of bars, restaurants, and ice cream shops Bring all the Up North toys you want, we have plenty of parking for boats or snowmobile trailers. 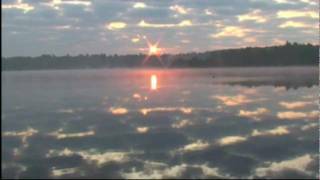 Up for some hiking, biking, fishing and boating in the Northwoods? You’ve come to the right place, especially for boating and fishing: Northern Pike, Bass, Walleye, Perch, Crappies, Bluegills and some Muskie. Eagle River has largest concentration of freshwater lakes in the world, so take your pick! It’s also home to Trees For Tomorrow, the Eagle River Historical Society Museum, Northwoods Children’s Museum, and much more. Guests often take scenic day trips to friendly towns like Conover, Land O’ Lakes, Phelps, St. Germain, Three Lakes and Minoqua..
Local’s favorites-for-the-family include PIRATES HIDEAWAY, ELMER’S FUN PARK, NORTHWOODS ESCAPE ROOM, NORTHWOODS ZIP LINE, WORLD SNOWMOBILE HQ. Let me know what you like to do! Go cart track, miniature golf (as well as many golf courses), horse back riding, and stock car track, are also available in the area. Antique stores are also in the mix of things to visit. Things to remember: BRING YOUR OWN BEACH TOWELS and Smore’s fixins for the campfire pit. Stop by the TRIBUTE BREWING COMPANY and stock up on some local flavors. Inquire for rates based on your group size and travel dates. We have had the pleasure of staying in this beautiful home twice. Once last summer and most recently last month. There was plenty of room and everything we needed for all four of our families. The large windows offer a panoramic view of the lake and Eagles!!! My 3 year old loved to play on the beach in the crystal clear water and my five year thinks he is the next Babe Winkelman after his fishing success. (the spider-man pole turned out to be a great investment) We enjoyed the clean cool air by the fire in the evenings and the large deck and grill are great for family dinners. Last month we brought up the snowmobiles to enjoy Eagle Rivers winter fun as well. The house has easy access to the trails and plenty of room for the trailer. The two big screens were great for watching movies by the warm fireplace after a long days ride. 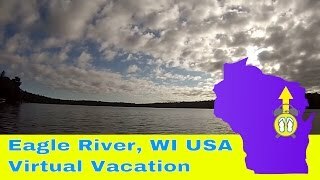 We know how to vacation in the Dells and I would recommend this place to anyone looking for a clean and safe family vacation.